First of all, some sad news. Those of you who have been following this blog for a while will know about Muttboy, our dog. Sadly, his health declined in the last year, and we decided at the end of May that the end had come. Fortunately, he had a good end with what we think and hope was a minimum of suffering. We are missing him greatly, though. Even with a new baby around, the house still feels too quiet. He is greatly missed. Cormac is doing well. At nearly five months, he now rolls over in both directions, although getting from front to back (which I thought was supposed to be the easier direction) only happens as an accident now and then. What he does now is roll over from back to front, struggle to roll onto his front again, fail, and then fuss until we turn him over ourselves. Then he repeats the whole process. As for reading, my reading pace has slowed considerably in the last few months as I’ve gotten back to work. It turns out that it’s work that keeps me from reading as much as I’d like and not the presence of a new baby. Although taking care of a brand new baby was difficult in the early months, it still left me with plenty of time to read — especially in the late night hours waiting for the baby to fall back asleep. I’m very grateful that I no longer spend my night hours that way, and I’m also grateful to be back at work (teaching summer classes at the moment), but now I’m squeezing reading into one or two hours at most in the evening. But that’s okay. Having a baby has confirmed what I already knew about myself: I am in no way whatsoever cut out to be a stay-at-home parent, and I should never, ever, ever attempt it. Thank goodness for Hobgoblin and daycare and working from home. One of my favorite books from the last couple months is Phillip Lopate’s To Show and To Tell: The Craft of Literary Nonfiction. I really loved this book, and I think it’s essential for anyone who wants to write or who likes to read literary nonfiction. He makes the argument that literary nonfiction doesn’t need to aspire to be like fiction, which is apparently something some people believe; writers in the genre should take full advantage of the opportunities it offers to “tell” as well as to “show,” to deal directly with consciousness and ideas rather than focus solely on the art of storytelling. I agree 100%. I like my literary nonfiction, and even my fiction, to tell me things, as a person talking to me might. I also admired Lopate’s judicious use of examples to make his points. Sometimes books of this type get a little too detailed with close reading of examples for my taste. I hasten to add that theories of literature stand or fall based on the examples used to back them up and close readings are valuable and important, particularly in books of a more academic nature. But when I read how-to books like Lopate’s, I’m more interested in theories than I am in close readings of particular books, and Lopate gets the balance just right. He also has a wonderful suggested reading list in the back of the book that would keep any nonfiction reader happily busy for a long time. I’m not entirely sure if Lopate’s taste in nonfiction mirrors my own or if it helped create my own; I discovered literary nonfiction through Lopate’s anthology The Art of the Personal Essay and his introduction to that book is another crucial work of criticism on the genre. I suspect I find myself agreeing vehemently with everything Lopate says in his recent book because I’ve absorbed his aesthetic over the years, whether I’ve been aware of it or not. At any rate: highly recommended. Sorry to hear about Muttboy–it’s always so sad to see an animal friend sick and watch their suffering–I’m glad he had a good end, but it is still really hard (I went through that with one of my cats last summer and it was awful so I can totally sympathize). 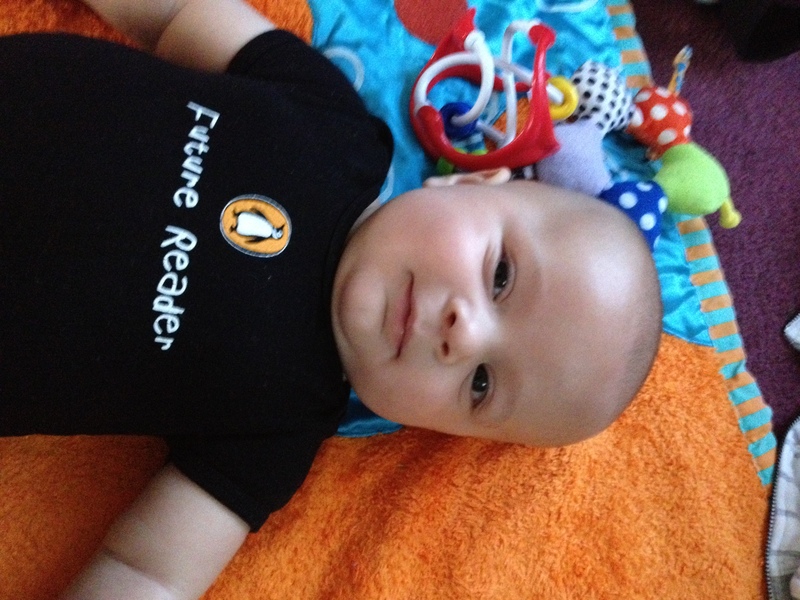 Cormac is a cutie and anyone who wears a “future reader” t-shirt like that knows how important it is for mom to get in a little reading every day! 🙂 Has he had a bike ride yet? I guess he’s still pretty small…. The Lopate book sounds great–I have it on my wishlist so will have to see if the library has a copy–I have dipped into his Art of the Personal Essay book and it is such a great resource. Hope you are enjoying your summer–even with teaching! Thanks, Danielle. Yes, it is very hard to watch a loved animal suffer. I’m sorry you had to go through it with your cat. Cormac hasn’t gotten on a bike yet, but it’s only a matter of time! Oh the book sounds wonderful – I’m going to look for it immediately. I couldn’t agree more about the possibilities for telling that literary non-fiction opens up. I was so very sorry to hear about Muttboy, and I perfectly understand why you want to get back to work – I felt exactly the same! Babies are gorgeous and you’d walk through fire for them, but they are also exhausting and perplexing in equal measure. Yes, definitely exhausting and perplexing — excellent words. Babies make my day job seem easy! I hope you like the Lopate book. I thought it might be one you’d enjoy. I’d read Hobgoblin’s post about Muttboy and I felt sad for you guys. It’s a big adjustment that takes time. On the baby front, I totally felt the same way when I returned to work post-baby. I hope no one is guilt-tripping you about that choice. Thanks, Smithereens. No one has tried to make me feel guilty about returning to work, thank goodness. People seem to understand. I’ve Lopate’s The Art of the Personal Essay for years. A treasured volume. To Show and Tell is definitely going on my wishlist! Jenclair — I hope you enjoy it! If you like one, you’ll probably like the other. I bought the previous Lopate on your recommendation and have never regretted it, so this is going on the list straight away. Even The Bears, who are not great lovers of dogs (I can’t for the life of me think why, but they flatly refuse to let me have one) are sorry about Muttboy but glad that his end was peaceful. As to babies who roll over and then gurgle away until you roll them back, we think there is a young man there who has definitely got your number! So sorry to hear about Muttboy! I’m sure you guys miss him so. Cormac is just too cute for words! Love his little t-shirt – that is perfect. With a job, a baby and everything else I’m impressed that you are still able to get in that much reading! Iliana — thank you! Reading is a nice refuge int he quiet hours that I have. I’m so grateful for my books — they make excellent company! I’m so sorry to hear about Muttboy. Losing a dog is so terribly hard! I was happy to go back to work as well when E was a baby…now that she is two and a half she can do so much more and I can see the appeal of perhaps eventually working part-time (I would never willingly take myself out of the work force completely)…as they grow and are able to swim at the pool, play at the park, paint pictures while you cook, etc a better balance definitely is struck! Courtney — I can see that children would be easier to spend all day with when they get older. I see the appeal of part-time work, too, although I’ve felt that appeal all my life, well before the baby! Oh Rebecca, so sorry about Muttboy. He had some wonderful adventures and such a good life. Hugs. Cormac gets cuter with every picture you post! Love his shirt! I am glad to hear about the Lopate book. I have been curious about it and waffling but now it will go firmly on my TBR list. Thanks, Stefanie. Muttboy did have a very good life. I’m so glad to help make the decision about the Lopate book! Sorry to hear about your loss in Muttboy. But happy to see Cormac growing up to be one handsome boy. I can tell he’s not only a future reader, but a future competitive cyclist too. He looks real strong. As for Phillip Lopate, coincidentally, I’m also reading a book which he is the editor. And it’s a treasure. I’ve two quotes from it on my current post. He’s a knowledgeable film critic too you know. And from your description here, I must read more of his works. Glad you’re back teaching. I’m sure that is a good way to recharge. Staying home and be a full time care-giver to a baby is exhausting in all respects, I knew that from experience. 😉 Just a look at Cormac I can tell you’re doing a wonderful job. But alway good to be able to go out and continue with your teaching responsibilities too. Have a great summer, Rebecca! Arti — I didn’t know that Lopate was a film critic, although it makes perfect sense that he is. Thanks for your kind words about Cormac! I’m enjoying my summer very much so far, and I hope you are too.